As much as anyone else, finance chiefs swap companies when unemployment is extremely low, job-hopping is profitable, and exciting opportunities abound. 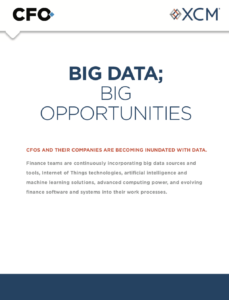 The CFO turnover rate for 2018 is 1.5 percentage points above its long-run average. But what about moving not just to another employer but to another industry? Being finance chief of one organization or in one industry for one, two, or even three decades has plenty of pluses. They include the opportunity to become immersed in the business and industry to a degree that enables highly nuanced decision-making. Many of today’s CFOs, though, see a downside: forgoing the diversity of perspectives and experience that time spent with multiple employers or industries brings. In addition, a case can be made that it makes sense to focus on CFO skills rather than industry: activist investors have no qualms about pushing for a CFO to be replaced if his or her experience does not match the company’s current situation, even if the CFO has significant industry chops. For example, pre-IPO tech companies almost always hire finance chiefs with public-company experience to steer them through an initial offering. 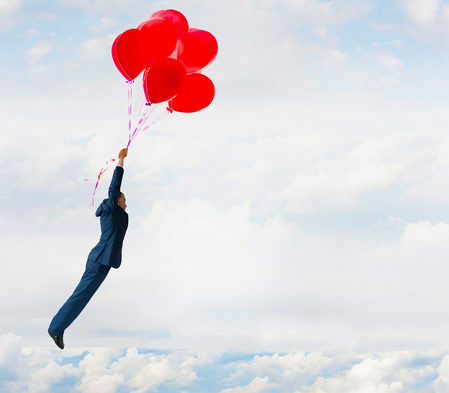 Can finance chiefs who switch industries be successful, and what would it be like heading finance in a sector totally different from your current one? 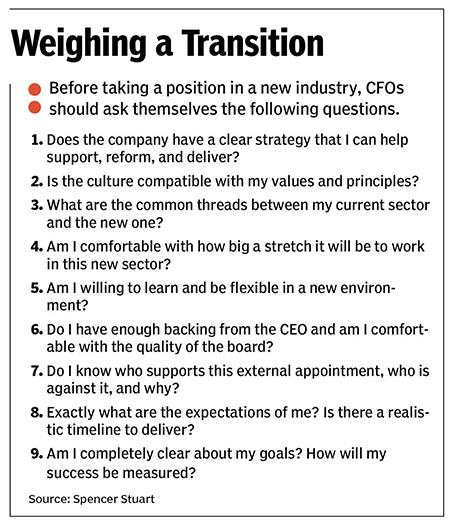 We spoke with three CFOs: two that have made interesting industry shifts and one that works in an industry few CFOs might consider switching to — until they read her story. Finally, if entering a whole new sector captures your imagination, now might be the perfect time to explore your options. That goes double if you have held a CFO job for a number of years. In an economy where talent is scarce, the most valuable experience a candidate can have is time in the lead finance role. When switching industries, know what makes a great finance organization and ask a lot of questions, says Change Healthcare’s finance chief. 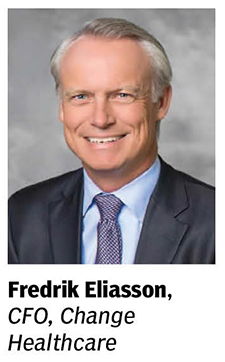 Count Fredrik Eliasson as one who thinks CFO skills are highly transportable across industries. Not everyone agrees. Indeed, it’s fairly common for finance executives to stay in an industry for their entire careers. For others, the time comes when they just want a change. Eliasson, 46, is among the latter. After 20 years with railroad company CSX, he switched industries in a big way by signing on in March 2018 to run finance at Change Healthcare. The firm provides software, analytics, network solutions, and other technology-enabled services to health-care payers and providers. The company was formed in March 2017 through a merger of Change Healthcare Holdings and a majority of McKesson’s technology solutions business unit. Change Healthcare is privately held, owned jointly by McKesson and Blackstone Group, but when the deal was announced in June 2016 the merger partners said they had pro-forma revenue of $3.4 billion. Eliasson left CSX in late 2017 without knowing what his next move would be. “I felt I wanted to do something different from what I’d done in the past in the industrial transportation space,” he says. When the opportunity at Change Healthcare arose, it certainly checked that box. CSX, aside from being in a much different industry, is a publicly held company that’s much larger, with a topline of $11.4 billion for its 2017 fiscal year. Change Healthcare, in contrast, is a private company that Eliasson could help take public at some point. “The opportunity set itself is different,” he says. In seeking the new job, Eliasson had a broader skill set to work with than some other CFOs. After serving as CSX’s finance chief from 2012 to 2015, he spent his last two years with the company as chief sales and marketing officer. He also had a previous sales role at CSX, in between serving in other finance roles. “But I felt my CFO skills were probably the most transferable,” he says. “If you approach finance with those sorts of objectives, then CFO skills are very much transferable,” Eliasson says. In fact, a top executive newly brought in from outside can be just the tonic some companies need. Meanwhile, what are some of the elements of Change Healthcare’s business that differ from Eliasson’s past experience? 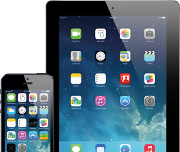 For one, the company has a multi-tiered revenue model.Software solutions are typically offered as software-as-a-service subscriptions. Other services have a volume-based pricing model. But a key aspect of Change Healthcare’s business is its contingency-based pricing model, where the company earns revenue only when customers derive value in the form of, for example, cost savings. Then there’s the product set. The company’s Intelligent Healthcare Network processes clinical, administrative, and financial transactions for hundreds of thousands of physicians, hospitals, and other providers, as well as commercial and government payers. The value of claims processed through the network tops $2 trillion annually. position at accounts payable firm Tipalti. 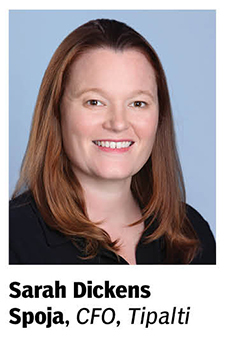 For Tipalti’s relatively new finance chief, Sarah Dickens Spoja, successful experiences in consulting and private equity led to her entry into a dynamic industry. After graduating from Williams College in 2004 with a double major in mathematics and economics, Dickens Spoja went straight into a four-year gig with management consulting firm Bain. There, she was heavily exposed to private equity, working on projects in the areas of buy-side diligence, customer research, and new product potential. Next came Stanford University Graduate School of Business, where Dickens Spoja earned an MBA in 2010. Newly minted diploma in hand, her first aim was to put her PE experience to work. So, she joined KKR Capstone, an independent firm that provides support for the deal teams and portfolio companies of PE giant KKR. Dickens Spoja calls it “probably the best job I could have had.” While she had done more traditional strategic consulting during her years at Bain, she “wanted to get more skin in the game,” which is what drove her to private equity. She was particularly interested in opportunities at financial technology (fintech) companies, the focus of half of her work at KKR Capstone. Notably, she had worked on the acquisition of a small fintech firm, Clover Network, by First Data, which KKR bought in 2007 and took public in 2015. Dickens Spoja was particularly attracted by Tipalti’s customer-retention rate, “which was higher than any I’d seen in the B2B fintech space,” she says. acquisition Clover, “but it has a lot of the same qualities,” Dickens Spoja says, because it has to figure out how to continue to grow fast, satisfy customers’ needs, open up more addressable markets, and fund growth. 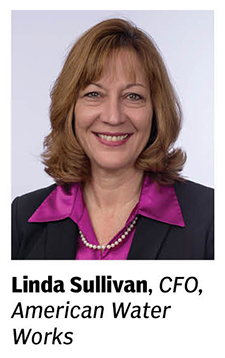 Being CFO of a public utility can be as challenging as the private sector, finds Linda Sullivan of American Water Works. The job of CFO at a public utility might appear on the surface to be rather bland. After all, strict regulations dictate many of utilities’ actions. Utilities don’t set their own prices for their services. They are much better able to forecast revenue than are most businesses. Their capital structure is established by state regulatory commissions, which also dictate a return-on-equity ceiling for their capital investments. Don’t try to tell Linda Sullivan that utilities are bland, though. The finance chief of American Water Works started handling a public utility account almost 30 years ago during her early-career days at a public accounting firm. That led to a 22-year stretch with electric utility Edison International, where Sullivan rose to the CFO role. In 2014 she moved to American Water, the biggest player in the highly fragmented U.S. water-utility industry. The heart of the job is balancing significant ongoing capital investments with the mission of achieving efficiencies that serve to keep customers’ rates as low as possible. That balancing act breaks down into four key issues. Most important among them is the supply of water. There is a finite amount of fresh water in the world, Sullivan notes. It comes from four primary sources: ground water; surface sources such as rivers and lakes; desalination of saltwater; and recycling and re-use. But supply is tight in portions of the United States, especially areas afflicted by near-chronic drought conditions. “We need to make sure we’re taking a long-term view of water supply and understand the risks—relating to water storage and water stress — in each of our locations, so that we can mitigate those risks,” says Sullivan, noting that American Water has coverage territories in 16 states. Such mitigation requires investment. For example, the company is building a desalination plant on California’s Monterey Peninsula, “because there’s really no other solutions in that area,” the CFO says. The second key issue is aging infrastructure. Like most other U.S. water systems, the pipes and other infrastructure American Water uses were installed well more than 100 years ago and need to be repaired or replaced. Here too, the challenge is making the right investments while keeping an eye on customer affordability. But in general, infrastructure upgrades tend to be good investments. The third big issue is water quality, which has been in the spotlight in recent years because of the polluted-water situation in Flint, Mich., and algae blooms in Lake Erie and the Ohio River. Sullivan’s challenge is making the correct investments in smart technologies that allow water quality to be measured at the source and that issue alerts when “something foreign comes into our water,” she says. The fourth key issue, which the company calls customer connectedness, is interesting because the company operates as a monopoly in its coverage territories. However, “the way we look at our customers is that if they were given a choice, we’d want there to be no question in their mind that they would choose us,” Sullivan says. In making decisions on all types of capital investments, American Water must take into account that household water usage is declining in the United States, slowly but steadily, at a rate of about 1% to 2% annually. That is the result of the increasing prevalence of low-flow toilets, more-efficient washing machines, and the like, as well as a growing “conservation mindset,” Sullivan says. “We must adapt our systems and rate structures to reduced consumption trends in order to cover fixed costs and maintain reliable service, while a number of fixed costs continue to rise,” Sullivan says. Such fixed costs range from capital needs to operating costs such as plant maintenance, customer service, IT support, and security. “The challenge is to work with regulators to be progressive in establishing rate structures that support appropriate levels of ongoing investment in the pipes and plants that ensure reliable service,” Sullivan says. Regardless of all the challenges, American Water is actually growing and forecasts a compound annual earnings growth rate of 7% to 10% through 2022. The company also buys, each year, 15 to 20 of the 50,000-plus water systems in the United States, typically ones operated by troubled municipalities. Deciding which ones to acquire involves answering two “sophisticated” questions, Sullivan says. “One is, where is the ‘stupid line’? At what price are we happy to walk away? If someone else is willing to pay that price, we can be happy for them,” says Sullivan. David McCann is Deputy Editor at CFO.